Find My Workspace lists over 95% of the business centres market in Wigan. Simply click Request Quote to check pricing for one office, or Add to Basket for multiple offices. 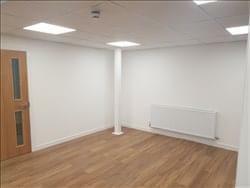 Serviced Business Space Available (with storage if needed). Ideal for Office Space but can be used for other wide ranging business activities such as Online Businesses, PT Instructors, Call Centres, Training Operators etc. No Long Term Commitment. Join Other Like-Minded Business Owners in a Thriving Business Community. Furnished Offices Available at No Extra Charge. FREE Use of Meeting Room. Plentiful FREE Car Parking for Staff & Customers. Also, Quality Additional Storage Space Available If Required.